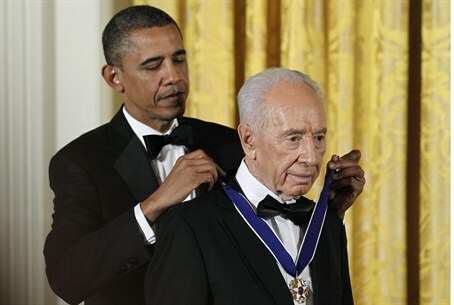 Prior to the ceremony, Peres and Obama held a private meeting, in which they discussed strengthening strategic ties between Israel and the United States, the Iranian issue, and advancing the peace process. During the meeting, Peres also asked Obama to grant a pardon for Jonathan Pollard on humanitarian grounds. Earlier on Wednesday, White House Spokesman Jay Carney told journalists that “our position has not changed and will not change today” regarding Pollard. “I would simply remind you that Mr. Pollard was convicted of very serious crimes,” Carney said. In response, MK Uri Ariel called on Peres to refuse the Medal of Freedom from Obama.